Thank you to friends and family for helping us mark a huge milestone at Ed Huck Marine this summer. We celebrated 125 years in business Saturday Aug. 16. This marina has been in the same family since Fred Huck established himself in this historic village as a boat builder in 1889. Today it is operated by the fourth and fifth Huck generations. Grace Plunkett, 2 1/2, a great-great granddaughter of Fred Huck, checks out a skiff. More than a century after Huck arrived in Rockport, we continue to take pride in our River heritage, our fine brands of boats and building relationships with customers in the world famous 1000 Islands. A special thank you to the Huck family, my wife Heather, our children Jack and Hannah, Ed Huck Marine co-owner and brother-in-law Peter Johnston, wife Jody, their children Cicely and Sam, father-in-law and mother-in-law Jerry and Becky Huck, Jerry’s brother Morris Huck and his wife Joyce. The Huck family is joined by politicians Senator Bob Runciman, Tory MP Gord Brown, Tory MPP Steve Clark and Leeds and Thousand Islands Mayor Frank Kinsella to celebrate the marina’s 125th anniversary. We all thank everyone who braved the rain to celebrate the occasion at the marina’s Scenic Lodge along with Conservative Senator Bob Runciman, Conservative MP Gord Brown and Conservative MPP Steve Clark and Leeds, Leeds and the Thousand Islands Mayor Frank Kinsella. 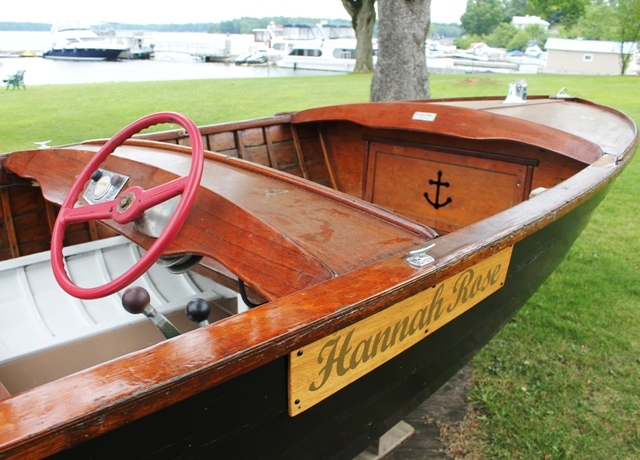 The Hannah Rose: A 1957 Lyman named after Hannah MacCrimmon, a fifth generation Huck. Jerry Huck, former president of Ed Huck Marine, and grandson of founder Fred Huck with Scott MacCrimmon at Scenic Lodge. Jerry, a third-generation Huck, now retired, was president and co-owner of the Ed Huck Marine between 1975 and 1996. He operated the marina with Morris. The marina started 125 years ago when Fred Huck, a German immigrant, came to Rockport from Cape Vincent N.Y. with his wife Ellen (Slate) Huck of Grindstone Island. Times may have changed. The view hasn’t. It’s an honour to carry on his tradition. While we have moved on from St. Lawrence skiffs to modern brands of Cobalt Boats and Boston Whaler Boats, our commitment to quality and customer service remains the same. We look forward to many more years of boating with you and your families on the river. Fred Huck launches a skiff nearly 100 years ago with sons Ed and Howard.